Women in their first trimester who contract Zika are believed to have up to a 13% chance of their babies having microcephaly. Scientists are zeroing in on the link between the Zika virus and microcephaly, a birth defect characterized by an abnormally small head and often incomplete brain development, and their findings are quite scary. 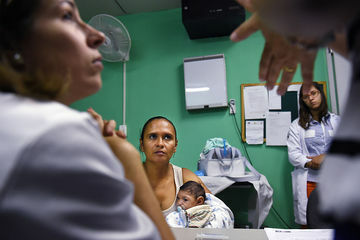 A new study, which analyzed data of Brazilian women, estimates that if a woman is infected with Zika during her first trimester, she is 1 to 13 percent likely to deliver a baby with the disorder. For women in their second and third trimesters, there was only a "negligible association" between Zika and microcephaly (though Zika is still dangerous in those stages). "It is an appreciable risk," said Michael Johansson, a CDC biologist and lead author of the study. "We need to do whatever we can to help women avoid Zika virus infections during pregnancy." Since microcephaly usually only occurs in .02 percent to .12 percent of all U.S. births, it's clear that Zika poses a serious threat. So it's no surprise that the CDC is closely monitoring 279 pregnant women with Zika in the U.S., and that public health officials are doing everything they can to learn more about the virus as quickly as possible. So far, Zika has spread across 40 countries and territories, with its epicenter believed to be Brazil. There, 1,400 cases of microcephaly and similar birth defects have been reported in the last year alone. No other countries have reported an uptick in microcephaly cases, but that is expected to change as Zika continues to spread. If you're pregnant or plan on becoming pregnant, stay up-to-date on the CDC's Zika guidelines and warnings, here.